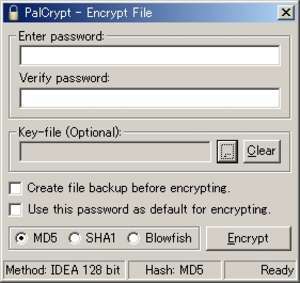 Palcrypt makes it easy for the user to have the files encrypted and that too without going to any other program to do that. Make the selection of the file that you want to encrypt and right click on it to make it encrypted. Select the option and then you would be shown a dialog box to apply the encryption. For the encryption you need to enter the password and make the selection of the key file if required. Version 3.0.0.1 is a freeware program which does not have restrictions and it's free so it doesn't cost anything. For security reasons, you should also check out the Palcrypt download at LO4D.com which includes virus and malware tests. Additional screenshots of this application download may be available, too.